Well anyone who experienced the apocalyptic winds at last weekend won’t be too surprised that we were met with scenes of mild devastation in the garden yesterday. Our beautiful sign! the collective effort of so many! Blown down! Snapped clean off! Pete and Co soon had it back up, though slightly lower than before. A test run by Jacob (pictured 6 foot 7 inches) showed it should still be tall enough (anyone 6 foot 9 and over and will be issued with a hardhat). And while that was going on other hardy volunteers proved that chopping down brambles can be fun! So it’s our birthday this Saturday 1st Feb! Two years old! How time flies… So if you’re free around lunch time please pop down and eat some soup and cake and warm yourself by the bonfire (pending howling gales/torrential rain we’ll light it noonish). We’ll be 10 until 2. This is traditionally the midpoint of winter, from here it’s just a short hop to spring! We’d love to see you and talk about happy gardening days past and tell you all about our exciting plots and plans for the future. (party frocks optional). Talking of the future we had a great volunteer meeting last week and the notes (thank you Kayja!) are uploaded on the website. Lots of good chats and it’s great to know that we’ve built such a strong team of committed volunteers who are ready to step up as we enter a world post lottery-funding. AND if you knew anyone who fancied coming along to our Golden Buds taster days get them to email me ASAP as we’ve only 3 spaces (out of 45!) left. Very exciting. This entry was posted in News from the Garden on January 31, 2014 by GHCG. 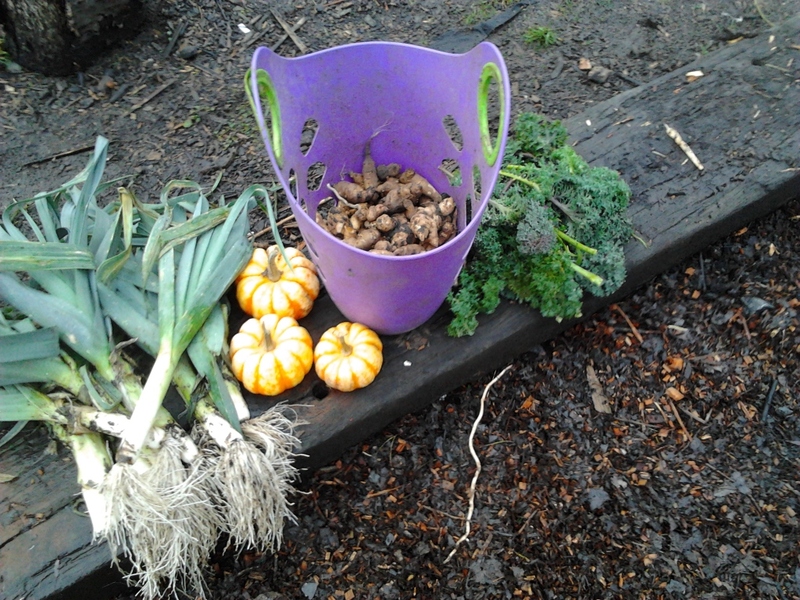 Last week while still waiting for a ‘proper winter’ we’ve been beavering away in the garden. Dougie and Bob were in the pond last week (heroes!) clearing the reeds before the frogs move back in and get busy while the rest of us were busy weeding, tidying, sorting and still harvesting loads of tasty veg. There is a deep satisfaction at following a Guardian recipe but having even posher ingredients. “Really? Hugh Fearnly Wittingstall, only one type of kale? tsk tsk” I think, gazing upon our medley of colourful kales…. So it would be great to see you! Especially if you’ve volunteered before but haven’t managed to get down in a while, or just been meaning to get down but haven’t had a chance. We’ll be open 10-2, but busy doing garden work until 12. So pop in, say hello, as we all pat each other on the back and marvel at how far we’ve come together! Any and all birthday cakes welcome!! 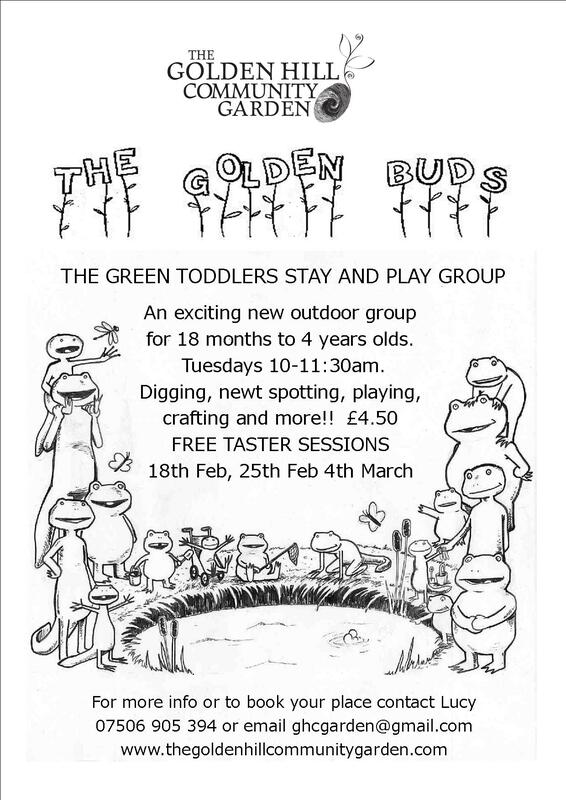 The Golden Buds Green Toddler group is coming together! We are getting bookings on three free taster sessions and we haven’t even put the poster’s up yet! Please spread the word if you know anyone with little ones. It’s going to be fabulous. Also people have been in touch to ask about the Friends of Golden Hill Scheme. If you’d like to be a Friend but aren’t keen on setting up a standing orders then by all means give a one off donation (£24… or more!) and get in touch and I’ll give you the bank details. We also accept cash, cheque, and gold ingots. This entry was posted in News from the Garden on January 21, 2014 by GHCG.